The perfect gift for you or anyone. All bags look alike and most bag tags look alike. Add the PhotoPog Bag Tag with YOUR picture and YOUR personal information and stand out from the crowd. Personalize yours now, upload your pictures, add the personal information and in just a few days you will have your PhotoPog Bag Tag to identify almost anything imaginable. 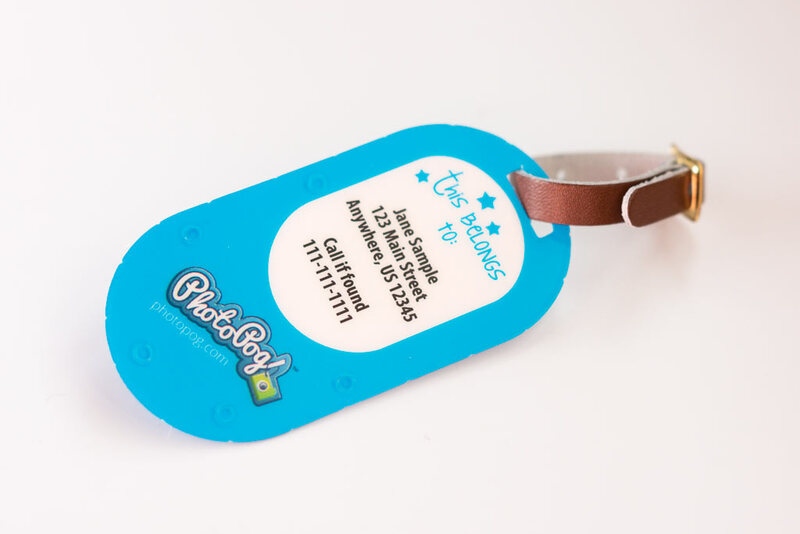 The PhotoPog Bag Tag is made of solid plastic and personalized with your own pictures and information. The PhotoPog Bag Tag works great for identifying your luggage, back pack, purse, or even your water bottle. Thick solid plastic and over-laminated to ensure longevity, digitally printed with your personalized information. All bags look alike but identifying YOUR bag with YOUR picture is so easy and your personal information goes on the back in case of loss. Use the same 3 pictures in your design or choose 3 different ones, more choice, same price. One for your backpack, one for your key chain and one for anything else, they add style to everything. Click the Design online button to start customizing your tag now.